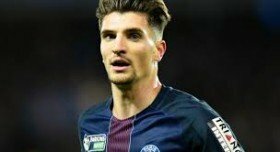 Manchester United are reportedly weighing up an approach to sign Paris Saint-Germain defender Thomas Meunier ahead of the summer transfer window. The Red Devils have been heavily linked with a move for Crystal Palace's Aaron Wan-Bissaka in recent weeks, but the emergence of Diogo Dalot has meant that they have seized their interest in the right-back. Still, The Sun reports that the club are keen on pursuing an experienced option for the forthcoming years as Dalot develops, and Meunier has been earmarked as the leading choice for the same. Meunier has been with Paris Saint-Germain for the past two-and-a-half seasons where he has contributed 12 goals and 20 assists from 98 appearances for the club. Young has been United's regular choice on the right side of the defence this term, but he is likely to be phased out during the 2019/2020 campaign where he will have turned already turned 34. Manchester United face West Ham United at Old Trafford this evening.